Badminton Racket Birthday Cake, a photo by CAKE Amsterdam - Cakes by ZOBOT on Flickr. Badminton racket made for a Badminton player. 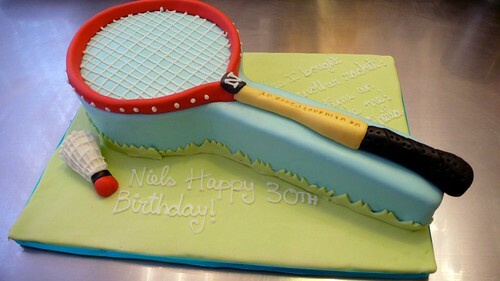 This cake was all about an inside joke or story... something about his wife buying him a racket that wasn't any good.... so now she bought him one he can eat! Very cute if you ask me! "Yes, I bought you another racket, this time an edible one! - Sheila"
Actually before it left the shop, it got a few red stars and i painted over the text red as well. I didn't know this, but in Chinese white is a sad color... and red is happy... so she wanted as little white as possible on the cake.